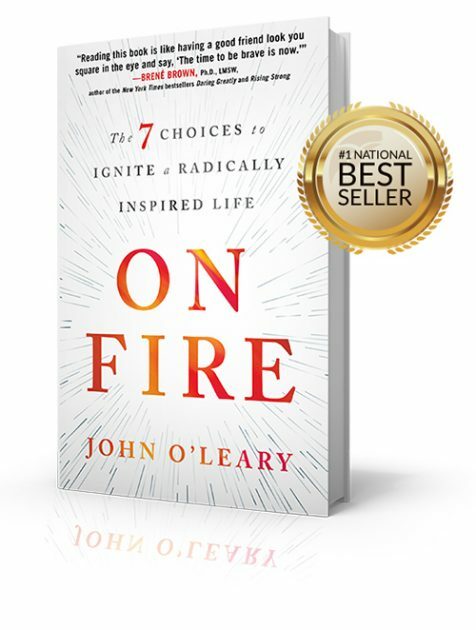 John’s much-anticipated first book, ON FIRE: The 7 Choices to Ignite a Radically Inspired Life was an instant #1 National Bestseller! It is already being translated into 7 languages and has sold more than 40,000 copies since it was published in March (a stunning number considering most books sell fewer than 10,000 copies in their first year). Watch the video and join the movement! Your seminar at Haysville last Friday was outstanding! I wish it had lasted all day!!! Thank you for your inspiring and engaging book! I am so grateful you put yourself out there outside of your comfort zone. Your real ness is so welcome and needed. It’s one of only 3 books in my life that I started reading and could not put down. I am 66 years old. I had a box of Kleenex and used the whole box, not from just crying, but also from laughing and considering. Best book I have read in many, many years. Love and hugs to John for sharing his love to all. Love this book! It was gifted to me. I’m reading it again for the third time. After receiving it, I read it within 48 hours. Then I read it again, section by section, over the summer. Each chapter, each section speaks directly to me. I highly recommend this book to anyone wanting to live an inspired life. I listen to John O’Leary speak in Richmond today and I have to say he had one of the most inspirational stories I have ever heard. He is a truly amazing person from his charm to sense of humor. May God continue to bless this man. Will have to read this! Heard John on Chris Brown then Dave Ramsey. One amazing human! Go Cards! If you haven’t heard John O’Leary speak from the platform of a sold out arena, you’re missing out on an incredible message. But you’re in luck! John has put his inspirational and life-­ changing message into this brilliant book. His story and words of wisdom will not only encourage you, they will ignite a passion to live your life to the fullest. My company gets the chance to hear from some of the country’s best speakers, and my friend John O’Leary is one of the best we’ve ever had. His incredible story of persistence, passion, and intense focus left a mark on my team that we were still talking about more than a year later. Don’t miss John’s message—he will change your life! When he was only nine years old John O’Leary survived a fire that should have killed him. But as he quickly learned, surviving is only the first step. In the ensuing years O’Leary and his family figured out how to move forward in life, how to get past the bitterness, anger and depression to thrive. O’Leary weaves his own riveting story around his hard-­won lessons about how to engage with the world, to demand the most from yourself and how to live a full and meaningful life. On Fire is true-­life story of post-­traumatic growth that everyone can learn from. There a rare handful of people in the world whose life story will change you forever. John O’Leary is one of these people. The powerful life lessons in this book will forever inspire you to live, lead and love differently. John O’Leary is truly one of the most amazing humans on the planet. His story will not only inspire you but give you practical ideas for how to enjoy your life more, appreciate all that you have, and push you to achieve all that you are capable of doing. Fast paced, emotional, and surprisingly funny, On Fire is an amazing reminder that, as John says, we might not be able to choose the path we walk in life, but we can always choose the manner in which we walk it.